[New for 2014] Friendly's treat line up has basically doubled since last year, and many of those first run treats now have many variations to choose from. Last year's black raspberry bar and vanilla bar now have many friends in the form of coffee, mint, coconut and black cherry (as well as two dual flavors that we'll cover in a future post). This is going to be a quick review since I devoured it in about 90 seconds. 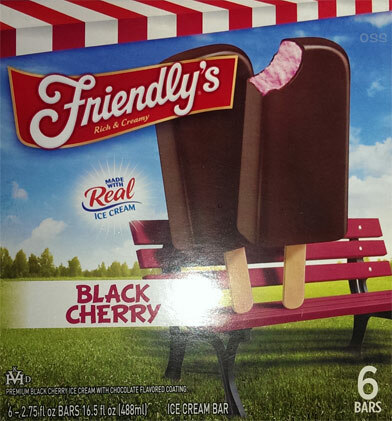 To put it simply, I like the fact that Friendly's is going out on a limb and putting a cherry ice cream bar out there. It's rarely done and I think it's a nice touch to the freezer aisle. If your longing for something with a bit of bite that's not too sweet, this is for you. This will have a fan base because there's no real competition for it. That said, I still don't fully understand the bar's construction. The choice to go with a thinner bar so that there is a better ice cream to chocolate ratio is a smart choice, especially with a tart cherry flavor. However, they really need to be using their regular ice cream instead of this soft stuff that is completely incapable of supporting the thin shell that surrounds it. What's the point of a decent flavored shell if it breaks apart so easily? 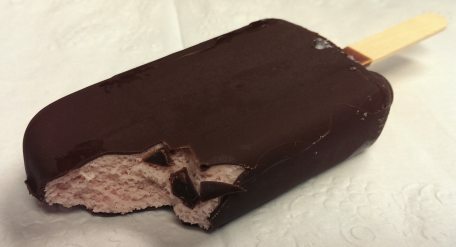 I get that they are trying to make something lighter than say a Magnum bar, but the ability to quickly devour these holds them back from being a huge hit with me.